LongIsland.com - Your Name sent you Article details of "Halloween Thrills & Chills, Fall Family Fun, News & More in October 18th's Newsletter!" Find out about all the fall fun and Halloween scares happening this weekend on Long Island right here! If finding big scares is your favorite part of the Halloween season, then you won't want to miss out on Darkness Rising Haunted House in Massapequa! There's been a zombie outbreak, and trying to escape the monsters that lurk around each corner is absolutely terrifying - you must find your way out in the dark! Proceeds from Darkness Rising go to local charity organizations - so why not get scared for a good cause this year? It looks like we're in for some good weather for the majority of the weekend - sunny, cool, and perfect for enjoying all sorts of October fun and Halloween scares! Whether you're planning to head Out East to go pumpkin picking or check out a corn maze, or you're visiting one of Long Island's many terrifying haunted houses, you won't be disappointed this weekend! The weather is just right for all sorts of fun, and we've got the scoops on some of the best entertainment for the weekend right here! If you still can't decide what to do, head over to our Events Calendar or Things to Do Section - both are jam packed with tons of great things to do this weekend, and all week long - the options are limitless! Celebrate the season this weekend, and get out there and make the most of October! Head Over to Ronkonkoma for Big Scares this Halloween! This October, if you're looking for big scares, then you won't want to miss out on Fright Night at Karts Indoor Raceway in Ronkonkoma - they've got 13 rooms filled with thrills and chills that you're sure to love! They're open Thursday through Sunday now through November 3rd, as well as on Wednesday, October 30th for those of you looking to squeeze in some extra scares during the week. The haunt is bigger and better than ever before this year - you'll never know who, or what will be lurking around the next corner! If you're ready to kick it into high gear for Halloween, head over to Fright Night this weekend, and be prepared to be scared! For more information, please visit their profile page, or call 631-737-5878. 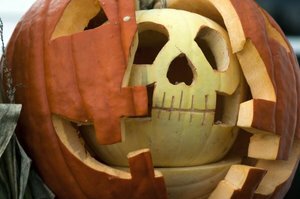 Jack-o-Lantern Carving Made Easy - Tips & Tricks You'll Love! Although pumpkin carving might seem like a daunting task, it doesn’t have to be - you don’t need to be too crafty to create something spooky! We’ve rounded up some useful tips for those of you who need some assistance starting out, and scary-good ideas for creating the perfect pumpkins this Halloween Season. Whether you're an amateur and this is your first pumpkin carving attempt, or you're an old pro who's looking for some new ideas to spice up your carvings this season, we've got you covered with great ideas that are sure to be a scare! Join the Walk on October 26th in Westhampton Beach! Are you a car fan? Head down to Nassau Coliseum this weekend for the Long Island Auto Show! You will be able to view some of the hottest new 2014 cars and trucks! There will also be free on-site test drives will be available and special appearances by Long Island’s Carfellas and much more! Admission is free for everyone. Check the listing for times . Don’t miss a fantastic weekend of auto fun! Tis the season for some scary fun! Why not do it for a good cause? Head down to the Scary Walk 4 Autism at Darkside Haunted House this Saturday, October 19th, from 1PM-5PM. The walk will feature a children's Halloween party, a bouncer, inflatable obstacle course, an inflatable slide, a scary walk and a popcorn machine! Admission is $5 and all proceeds will benefit Justice 4 Autism. Rain date is October 20th. Bring the whole family for the spooky event! October 21st through 27th, you won't want to miss the Gold Coast International Film Festival happening in Great Neck! Featuring a variety of films focusing on Long Island's rich culture and history, this star studded event is a must for anyone who has a passion for film. For a full schedule of screenings, ticket costs, and special presentations, be sure to visit their website! Looking for some Halloween Fun this weekend? Look no further than The Whaling Museum at their Halloween Fun Festival! This event will feature lots of fun for both adults and children including airbrush tattoos, zombie chases, touch hissing roaches, gross touching tables, a coin hunt, a wheel of horror, Halloween crafts and dissecting an owl pellet! Select stations are free, admission is $1-$3 for others and museum exhibits. Don’t miss this great family event! October is Breast Cancer Awareness month so now is the time to help get the word out! Head down to Make Strides to End Breast Cancer this Sunday, October 20th, at Jones Beach to help make a difference. You can walk in memory of a loved one or just to help raised awareness for those who are currently suffering through this disease. The walk will begin at 8AM and go through 11AM. Donations are most welcome. Head down for a walk for a good cause!